As a follow-up to his bestselling Mythos, Stephen Fry brilliantly retells the tales of Greek heroes in his new book, Heroes. Mortals and Monsters. Quests and Adventures. This time, Fry enters the Age of Heroes – where heroines are not far away. In a ‘twisted labyrinth’ and with a ‘blood-curdling monster’ called the Minotaur, Theseus with the help of Ariadne slays the man-eating creature. Before that he had promised her ‘you will sail with me back to Athens and we shall rule together as king and queen.’ By following the thread (a ruse made up by Ariadne), he found his way out of the labyrinth again – back to Ariadne (Fry, p. 377). 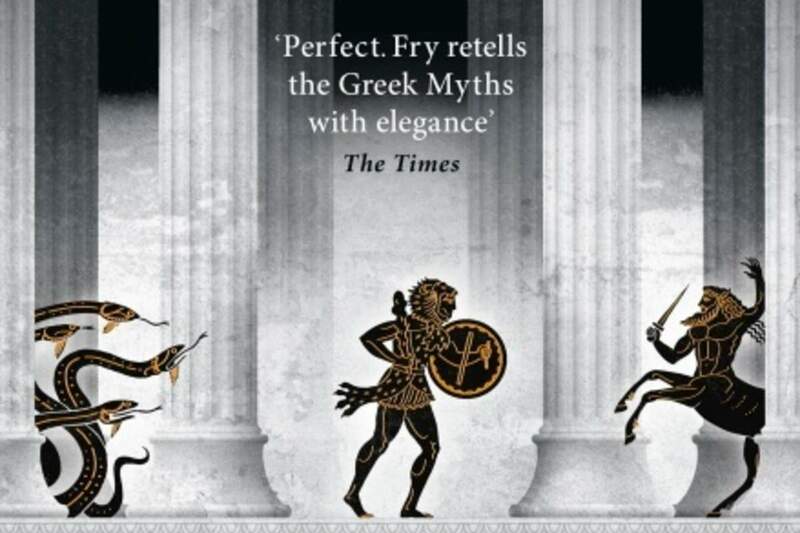 As a follow-up to his bestselling Mythos, Stephen Fry brilliantly retells the tales of Greek heroes in his new book, Heroes. Mortals and Monsters. Quests and Adventures. This time – and with the Gods still very much around – Fry enters the Age of Heroes. But in the male dominated world of heroes, heroines are not far away. 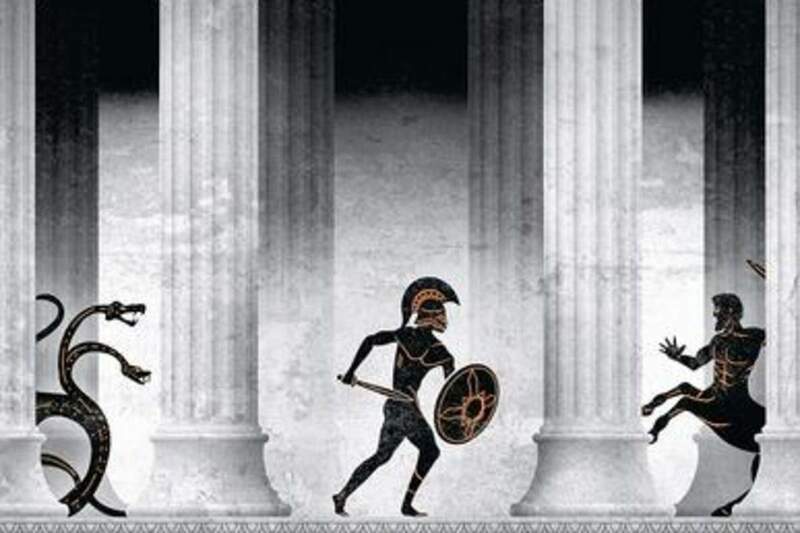 The heroic stories of Antiquity – just think of the adventures of Jason, Theseus, Aeneas – became all-time bestsellers that have since become the subject of the most elegant manuscripts, tragic operas, romantic paintings and now, Stephen Fry's popular books. 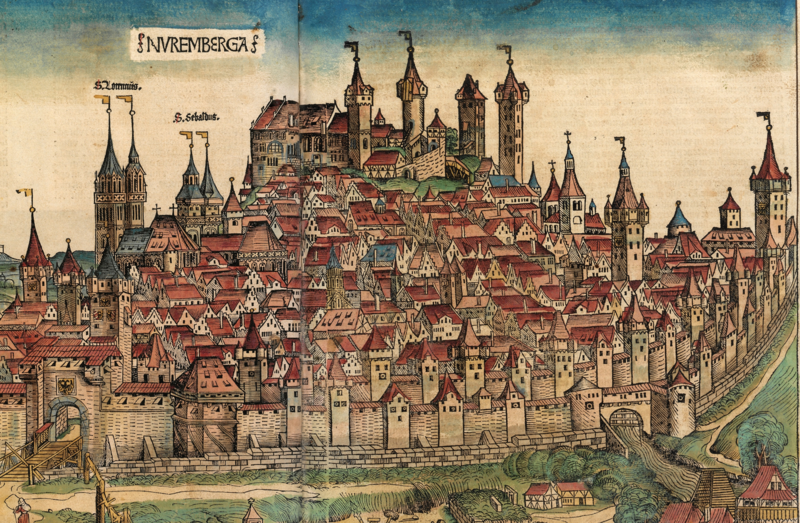 Nuremberg at the end of the 15th century, was one of the most bustling and industrious cities in Europe. With its vibrant art scene, its flourishing industrial areas, and devotional activities throughout the city, it attracted many visitors. From far, travellers would recognize the towers of St. Lorentz's and St. Sebald's, the two most important parish churches of the town that were also highlighted in Hartman Schedel’s world chronicle (Nuremberg, 1493). Schedel's Chronicle was financed by Sebald Schreyer and his brother-in- law, Sebastian Kammermeister. Schreyer, in particular, was involved in various book productions. An enigmatic interpretation? Two devices explained. The fine humanist manuscript of Solinus' Collectectanea rerum memorabilium ('collection of memorable things') is most elegantly executed. When we were analyzing the book, the devices on the openings page of the text remained unexplained. Here we try to solve the enigma. The script of the book is attributed to Giovanni Marco Cinico, the highly appreciated royal copyist and librarian at the Aragonese court in Naples, who likely collaborated in this manuscript with Cola Rapicano, the official illuminator in Naples from 1451 to 1488. 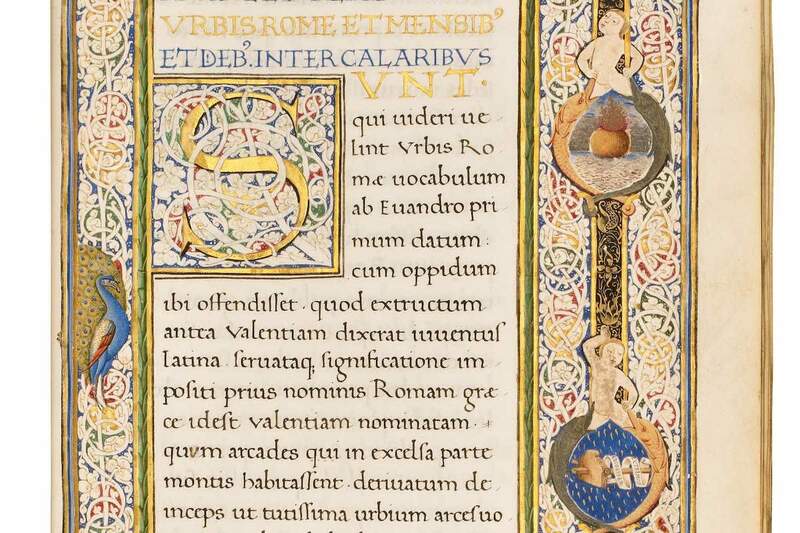 Without sparing material, the scribe and illuminator together created an extremely fine and beautiful book. During the first half of the 13th century, Blanche of Castile (d. 1252), queen and queen mother of France, often resided in Paris. 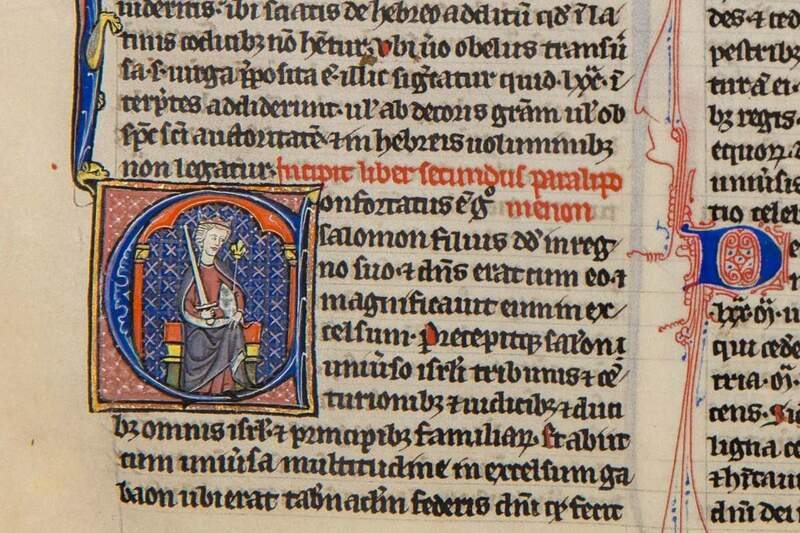 Her patronage of illuminated manuscripts was extensive and refined, for which she is called “the first important royal patron of the thirteenth century”. In overseeing the education of her children she exhibited a compelling concern for their spiritual welfare. Of the six of her children who survived childhood, Louis IX and Isabelle of France, reached sainthood. Her dedication as a mother and educator is recorded in various works of art. 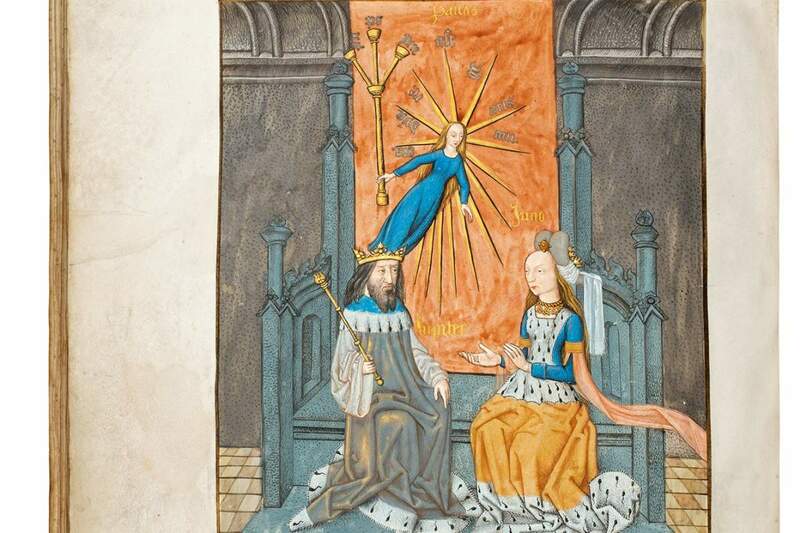 Presumably, the famous manuscripts of the Bible Moralisée were produced for the French royal family under her patronage. These were quite innovative works with a didactic function. 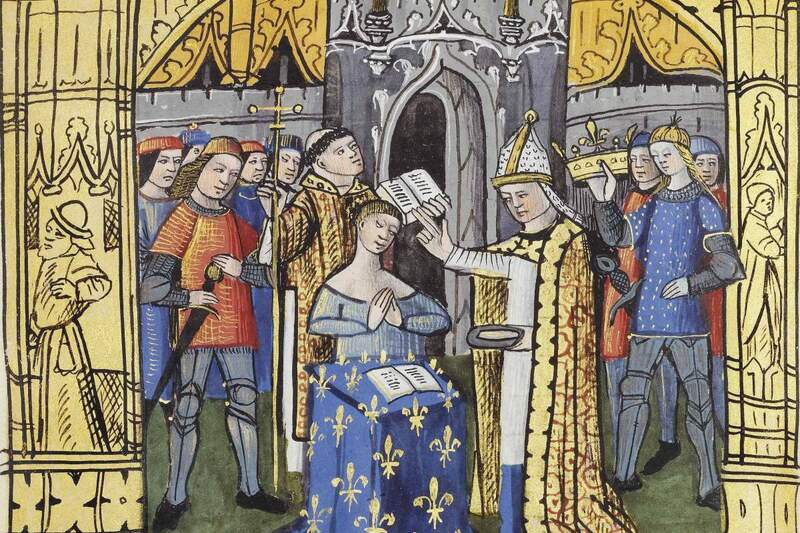 As Queen of France and twice regent (the second time when Louis IX was on crusade, 1248-1254), it was through her extensive patronage of art that Blanche had lasting effect. The queen is also considered to have been patron to the design of the Sainte-Chapelle (1238-1248). In that royal chapel as well as in manuscript illumination, the fleur-de-lys symbol is omni-present. 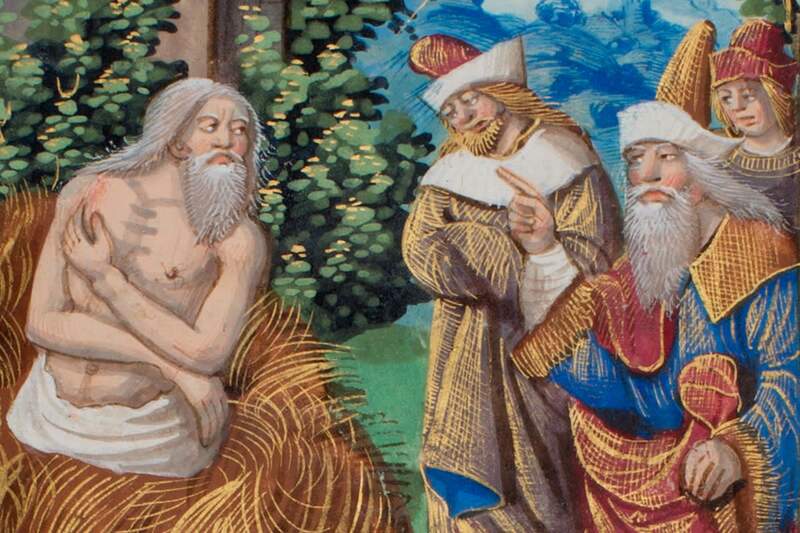 In the illuminations in our Parisian Bible (illuminated by an artist of the Royal Psalter Group), royal power is expressed in the fleur-de-lys at King Solomon (f. 139v), at Cyrus king of Persia ordering the building of the Temple (f. 152r), and in the image of King Artaxerxes (f. 155r). The birth and especially the resurrection of Christ are the most important festive days for Christianity. They form the beginning and the end of the winter cycle during the ecclesiastical year. 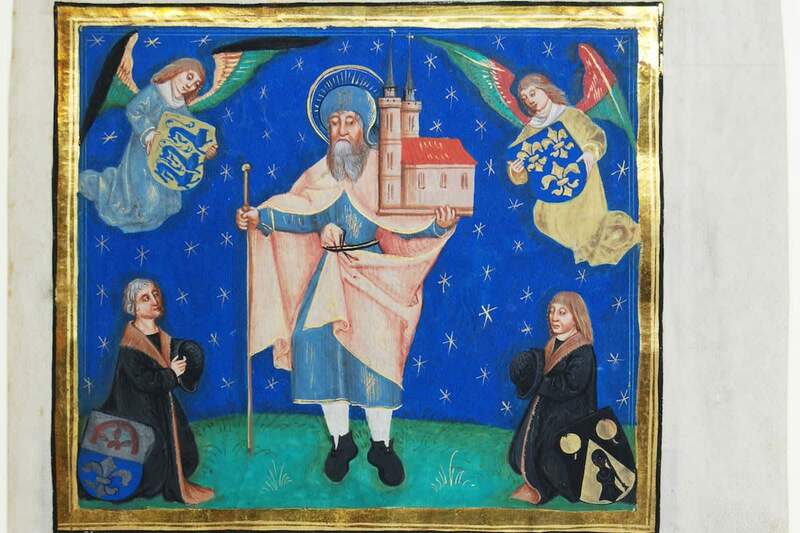 Many medieval liturgical books revolve around the celebration of saintly feasts throughout the year. Here we encounter a beautiful Swiss-German Breviary from the 15th century with a great number of decorated initials and a glorious page that tells the story of Christ's nativity in an entertaining and endearing way. Juno, Argus and Yo as depicted here, tells us the fate of mortals in the hand of the gods of Antiquity. Two miniatures in the manuscript made for Raphael de Mercatellis (see previous blog post) tell the mythological story of Yo and her warder Argus (a story told by Ovid [d. 17 CE], Metamorphoses I: 601-788). 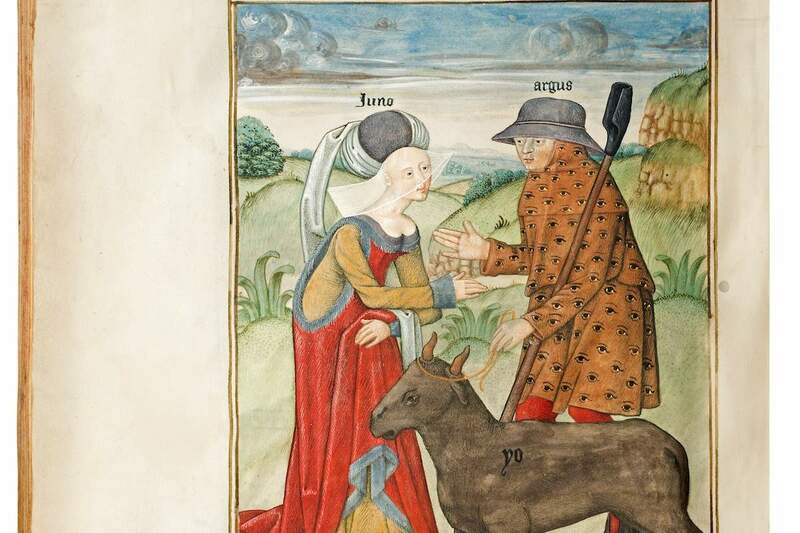 The illustrations show that after Jupiter fell in love with Yo, he turned her into a heifer to conceal her from the jealousy of his wife Juno. Juno then set the herdsman Argus, who had 100 eyes all over his body, to guard Yo. Stephen Fry also lets us follow Zeus-Jupiter in this example of one of his extra-marital escapades, when both he and his wife Hera-Juno bring about a terrible fate to the innocent protagonists Argus and Yo. Argus was a loyal follower of Hera-Juno. He also possessed a very special gift, which made him a perfect guardian of Yo. He had a hundred eyes…. Obedient as ever to Hera's will, he stationed himself in the field, fixed fifty eyes on Yo and let the other fifty range independently around and up and down, on the lookout for marauders. … Zeus knew his limits of his own cunning, however, so he called upon the wiliest and most amoral rogue on Olympos to aid him. Hermes-Mercury understood right away what needed to be done…. For two hours he played (a set of pipes) and he sang. The music, the afternoon heat, the scent of the poppies, lavender and wild thyme, the soft lapping and purling of a nearby stream - slowly Argus's eyes started to close, one by one. …. With Argus dead, Juno, who had seen what happened, sent down a gadfly which stung Yo so painfully and persistently that she bucked and screamed and galloped away, far from Zeus's reach. (Fry 2017, pp. 190-192). For centuries, books have been written to share knowledge, inspiration, and discoveries. What many of us may not realize is that the Middle Ages determined what texts were handed down from Antiquity onwards. Had it not been for the scribes and patrons of late Antiquity and the Middle Ages, the entire literature of Greece and Rome would have perished. 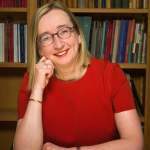 Medieval illuminated manuscripts gave stature to these ancient texts and thus contributed, to a large extent, to their preservation. Last November, Stephen Fry, the famous British comedian, actor, long-time quizmaster, as well as successful author, published a retelling of stories that the ancient Greeks invented about the birth of the universe, their gods, and the creation of humankind (Michael Joseph - Penguin Books 2017). As a child, Stephen Fry fell in love with these stories, which have never left him since. His lively, funny, and erudite book conveys this passion for Greek-Roman myths, which the author shares with numerous predecessors as well as contemporaries. One such a "predecessor" is the Flemish bibliophile, Raphael de Mercatellis, and here we present a medieval illustration from his library that attests to a myth also in Fry's book (we give here only the Latin names, not those in Greek). 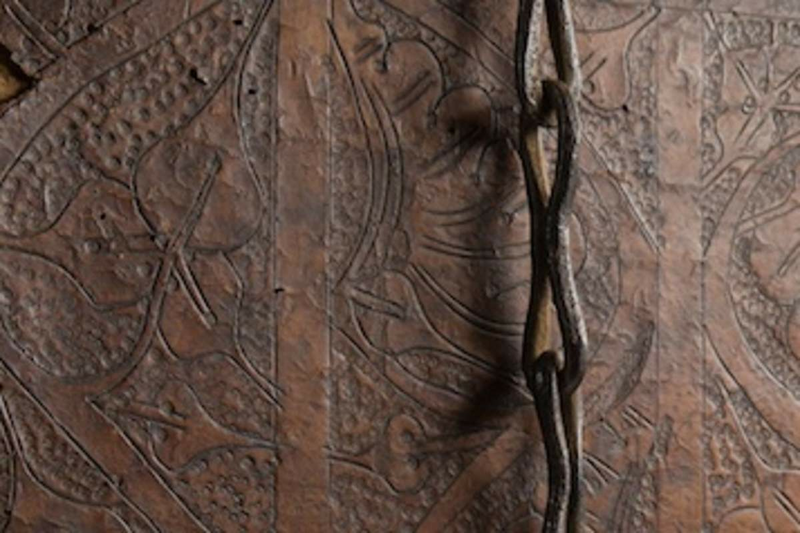 The present beautiful and well preserved old binding from the first half of the 15th century is not only a magnificent example of the rare and sublime technique of cuir-ciselé (carved leather), but also still has its original chain with which the book was attached to its lectern in the library. 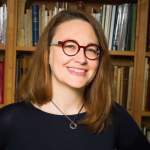 Medieval French "world" chronicles often recount history as a fairly direct line from biblical history, through ancient battles in Troy and Rome, to the foundation of Christian France, and up to the time in which the history was written. 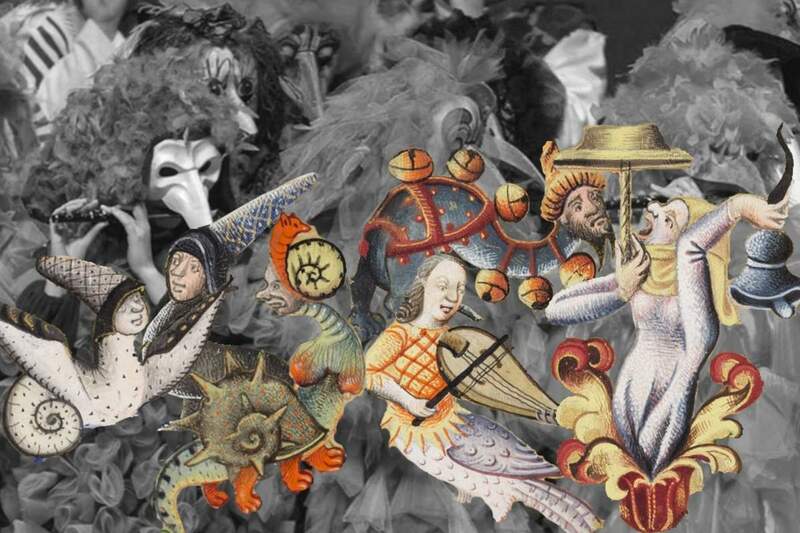 Many of you might have experienced the most bizarre and foolish of times in Basel: since four o'clock a.m. last Monday, "Frau Fasnacht" (Madame Shrovetide) ruled the city. Cliques were parading up and down the city centre as well as in front of the Antiquariat Dr. Jörn Günther, playing their music; stopping only occasionally to have a drink or a hot flour soup to refresh and restore themselves. The idea of the inverse world – where everyday laws are turned upside down and those who usually have to bow their heads and serve call the shots – reaches back to antiquity. The chasing away of winter, darkness, and evil spirits has been a tradition since ancient times. Not often, unknown Dutch manuscripts turn up that can be identified by the coats of arms of their noble patrons. 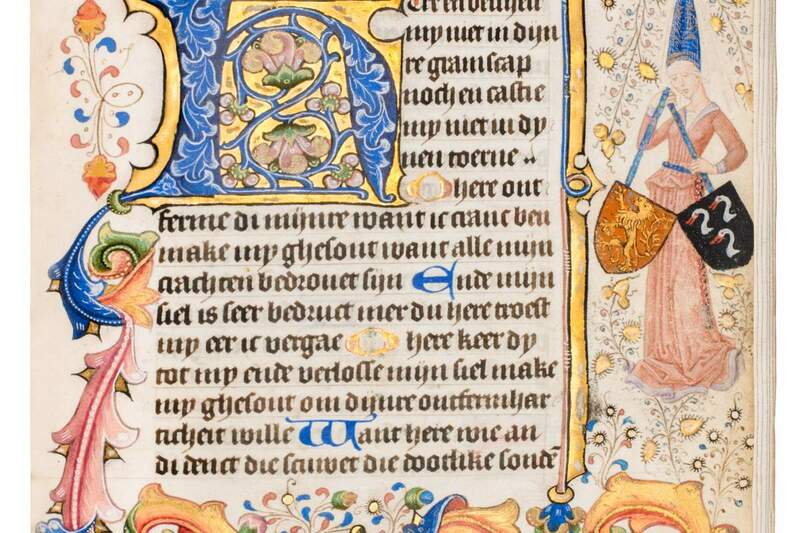 A remarkable Book of Hours made in Delft, contains, on three pages, the coats of arms of Hendrick Nagel van Voorhout and Immesoet Duyst. 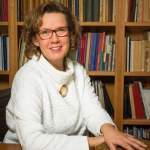 Both husband and wife descend from old Delft families going back to the early 14th century. They are known as brewers, church master, aldermen, and burgomaster. Hendrick and Immesoet count as the founders of the Duyst van Voorhout family.